Hi everyone! I'm so happy that October has arrived! It's my birthday month, fall is in the air, Halloween hijinks are upon us, and it's a big month for awareness as well! 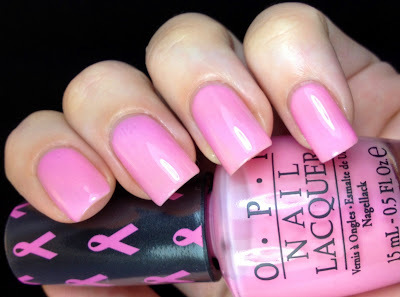 One of these important causes is Breast Cancer, and OPI has designed a new duo to help raise awareness. 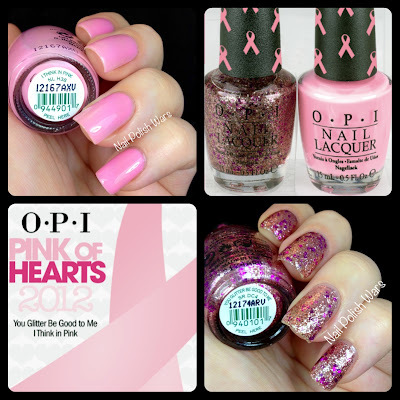 OPI has launched its sixth annual limited edition Pink of Hearts promotion, featuring the classic pale pink shade I Think in Pink and the new sparkle-packed hue You Glitter Be Good to Me. This duo pack is designed to raise awareness and funds for breast cancer research and support. 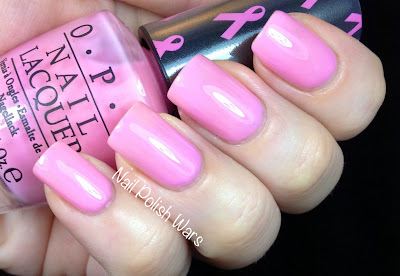 In 2012, OPI will donate $25,000 in honor of Breast Cancer Awareness Month (October) to Susan G. Komen for the Cure®. OPI will also donate $5,000 to Rethink Breast Cancer in Canada. 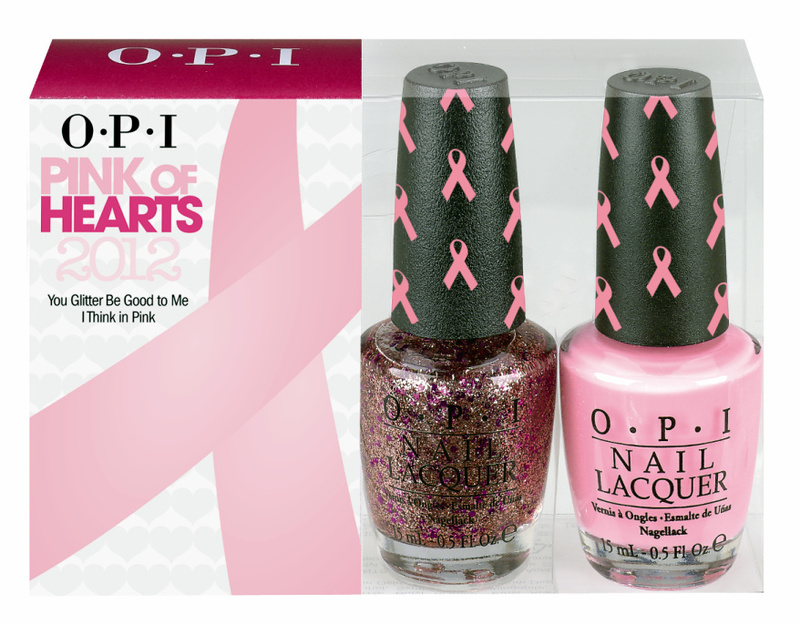 Pink of Hearts 2012 includes two shades sold in one pack – the pale pink I Think in Pink and the vibrant You Glitter Be Good to Me. 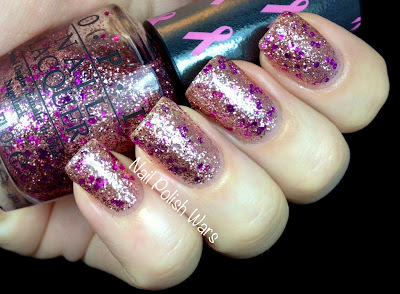 This sparkly lacquer is packed with both micro and macro glitters in pink and magenta, and can be worn alone or layered on top of I Think in Pink. Each bottle of I Think in Pink and You Glitter Be Good to Me nail lacquer has a special pink-ribbon cap wrap in support of breast cancer awareness. I Think in Pink is the perfect soft pink. It is such a pretty and delicate shade. I instantly felt more feminine while wearing it. The formula itself is a bit on the sheer side, but is easily build-able. Shown is three coats of I Think in Pink. 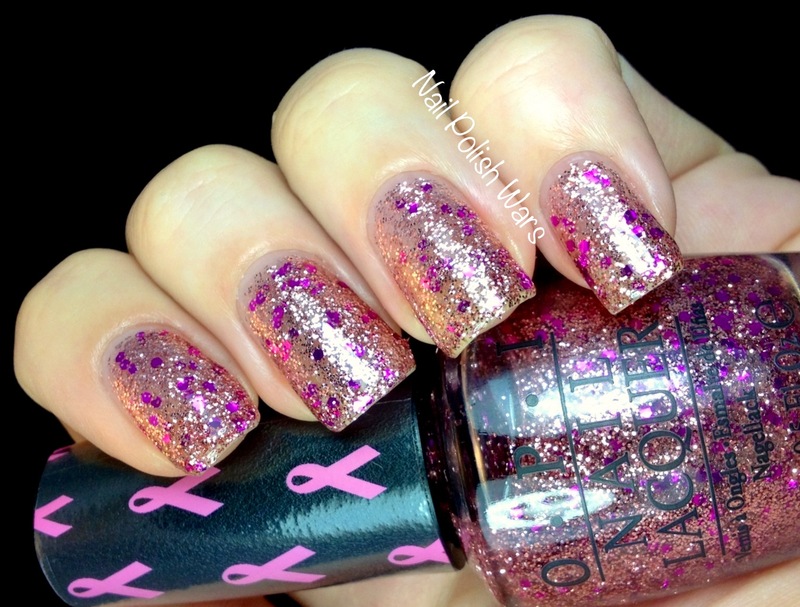 You Glitter Be Good To Me is a clear coat glitterbomb packed with light pink micro glitter and dark pink hexes. This can easily be worn on it's own. Shown is three coats of Glitter Be Good To Me. To be honest, I'm not crazy about this one. The micro glitters flash a bit too much gold for the true pink to show through. The formula itself was easy to work with and applied without difficulties. Aside from a personal color issue with Glitter Be Good To Me, I think this is a wonderful duo for an amazing cause. I hope you all enjoy them as well! Dang it girl!! I thought I could live with out these until I saw YOUR swatches!! oh well, I just ordered some of your polish also. Guess I will just be in a buying mode this month! These are lovely! and for a good cause - we can feel good about spending money! I love glitter, but I think I like the pink by itself better. I wasn't going to get it, but now I might have to after seeing your awesome swatches.